The field of global health is witnessing a shift in focus from disease-driven initiatives to projects aimed at increasing the sustainability and strengthening of health systems. A crucial component to this is universal health coverage (UHC), which seeks to address financing schemes for health, separate from efforts to provide both adequate numbers of health workers and structures for health-care delivery. UHC may be provided by government or through a combination of private insurance schemes, public-sector planning, and employer-based programs. Countries across the world, from China and India to Rwanda and Mexico, are beginning to implement different universal health coverage schemes, marking a rise in interest and political will for universal health coverage. 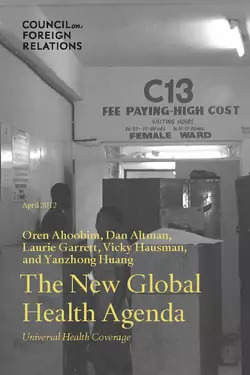 In The New Global Health Agenda: Universal Health Coverage, authors Oren Ahoobim, Daniel Altman, Laurie Garrett, Vicky Hausman, and Yanzhong Huang discuss this rise in support for universal health coverage and the financial benefits that may be reaped by implementing such schemes, and provide examples of models used to date by countries in establishing universal health coverage. Democracy has played little role in the recent history of global health, but new research published in the Lancet shows democracy is becoming more important as the health needs of low- and middle-income nations shift from infectious diseases to noncommunicable diseases.